Fun Facts And Information About San Roque! Loreto Plaza which is now famous for Harry’s Plaza Cafe, Chaucer’s Books, Seven Day Nursery and Gelson’s was previously a lemon orchard before the plaza was developed in the late 1950s. There are two incredible breakfast places in San Roque, Jeannine’s and Renaud’s Patisserie. Jeannine’s has a killer egg and bacon burrito and a delicious french toast with fresh berries. If you like more of a European style breakfast definitely check out Renaud’s. They have some of the best croissants and pastries in town! Here is a tip…if the restaurant is busy, they sell Renauld’s pastries at Gelson’s which is also located in Loreto Plaza. Pizza Guru is a perfect spot to pick up lunch. They offer a large variety of pizzas and are known to load the toppings on. They don’t believe less is more! The iconic Harry’s Plaza Cafe is a must for dinner, not only because of the delicious food but also for having the most generous drinks in town. The bartenders absolutely pour a big, stiff drink! And where else in Santa Barbara do you have a waitress that has been serving locals for over 35 years! Have you been dreaming of living in this very charming family friendly neighborhood located walking distance to State Street, Parks and Schools? Single-family homes in today’s market are selling anywhere from around $1 million and they can go all the way up to just above $2 million. Condos for sale can be found priced anywhere between $550,000-$1,400,000. The new development located on State Street called Estancia is offering brand new luxury Spanish Colonial Revival condos priced from $965,000-$1,315,000. These prices are anticipated to go up after the first phase has been sold out. Driving through San Roque you will instantly fall in love with the neighborhood. All of the homes offer unique charm and architecture. The streets are lined with beautiful mature trees. Living in San Roque provides you with a small town feel, but it is conveniently located to all the amenities you could possibly need. -All information is deemed reliable, but is not guaranteed. What are your favorite things about living in Santa Barbara? 1. What other city in California is nestled between the mountains and the ocean? Where else do homes have both mountain and ocean views? In Santa Barbara, you can hike the same day you take a swim in the Pacific Ocean! With an average year-round temperature of 70 degrees, where else do you want to be? -One of our favorite hikes is Inspiration Point and our two favorite places to hop in the ocean are either East Beach or Butterfly Beach. 2. Santa Barbara has been said to be in the top 10 cities for the most eateries per capita! If you are a foody then this is the perfect place for you. -A handful of our favorite restaurants include Loquita, The Lark, Brophy Brothers, Via Maestra 42, Jane, Los Agaves, Jeannine’s, Helana Bakery, and The Honor Bar. 3. Santa Barbara is a pet-friendly city! The city offers dog parks, dog beaches, and doggy friendly restaurants. -One of our favorite dog parks is Tucker’s Grove. Our favorite spot that allows dogs on the patio is The Bistro at The Bacara Resort. Okay, this is the biggest kicker…you can do yoga with a room full of cats at Cat Therapy! 4. Santa Barbara offers incredible shopping. Downtown Santa Barbara enjoys the beautiful outdoor Paseo Nuevo mall anchored by Nordstrom, along with State Street boutiques, cafés, ice creameries, movie theaters and more. La Cumbre Plaza is another beautiful outdoor mall that is well known for its wonderful Pottery Barn, The Lure Restaurant (don't miss the delicious charbroiled oysters) and its newest eatery, Islands Restaurant. If you are looking for a great affordable sandwich stacked full of turkey then head over to Plaza Deli! On another exciting note, the city is finally getting a Target Store! 5. You will never run out of fun things to do when living in Santa Barbara. The activities are endless. You can head down to the Funk Zone for a day of wine tasting. Every Sunday there is a beautiful art show on Cabrillo Blvd. that offers everything from oil paintings, crochet, lawn art and jewelry from local artisans. Lower State Street has an incredible children’s museum, MOXI, for endless family entertainment. The Santa Barbara Zoo is like no other. Don’t miss the train ride! We can’t forget to mention the awesome Westwind Drive-In Movie Theater in Goleta! The popcorn is unforgettable! -A few of our favorite wine tasting rooms include Riverbench, Corks and Crowns and Les Marchands. We are Santa Barbara locals and now you know why we will never move away :). Within the last week, 2 title companies in Santa Barbara have reported attempted wire fraud. According to a local escrow company, "The fraudster falsely informed the buyer that there was a change in the wire instructions, and followed up with a text message to the buyer. Below are 3 great tips from California Association of Realtors to avoid falling victim to wire fraud. The most important thing to remember is that wire instructions rarely change. If you receive an email stating the wiring information has changed, then call your escrow officer immediately to confirm the information that you received. Have you been dreaming of renovating a charming ranch style home, or building a beautiful grand estate? 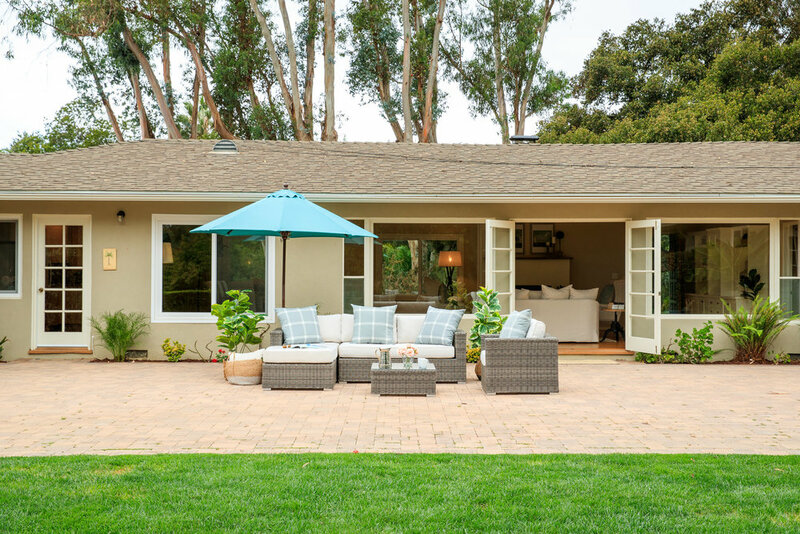 Nestled in the heart of Montecito this wonderful property offers endless possibilities. Located down a private lane just past the coveted Montecito Union School, this single-story home is situated on a park-like approximately 1.3-acre parcel. The residence boasts 5 bedrooms and 3 full bathrooms, open beam cathedral ceilings, oak floors, a lovely fireplace, and walls of windows offering an abundance of natural sunlight. French doors open to a spacious patio, seamlessly extending the living space, perfect for al fresco entertaining. The approximately 3,140sf home enjoys a flexible floorplan with 2 master bedroom suite options, 2 additional bedrooms, and a separate wing that includes a den, and bedroom with full bath, perfect for guests. The usable parcel offers ample space for a pool and guest cottage. Located just minutes to the Upper Village, San Ysidro Ranch and Butterfly Beach, this home is being offered for the first time in 50 years! Your opportunity awaits! 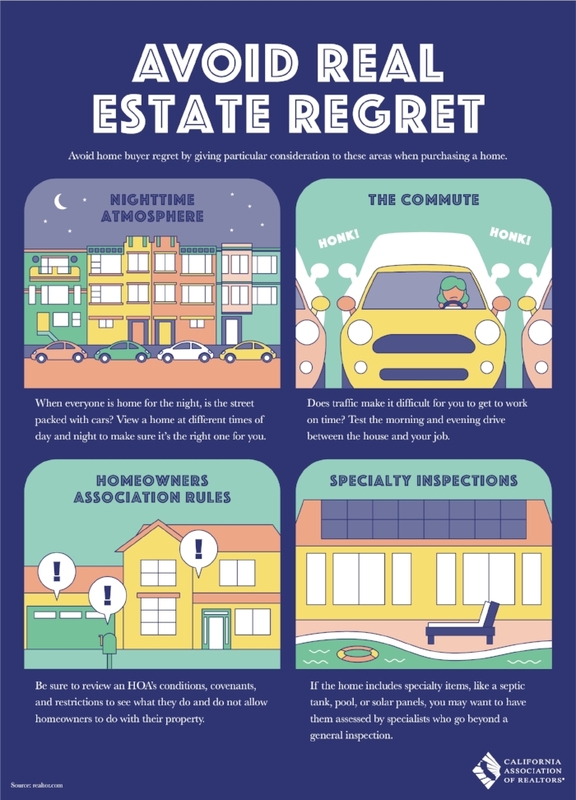 Image brought to you by California Association of Realtors and the "One Cool Thing" Infographics. Real estate is a valuable long-term investment that can bring in substantial income if you use high-end properties as rentals. However, it is essential that you properly protect your real estate investments for yourself and your family. Whether your total investment is a modest home in the suburbs or a string of rental properties that are a source of passive income, you should use estate planning strategies to protect your assets. There are two things that put your real estate assets at risk. First, a lawsuit from an angry tenant could strip you of some or all of your assets. Secondly, the probate process could fragment your family as they disintegrate into a frenzy after your death. The emotions associated with the loss of a loved one can cloud rational thought and exacerbate an already tedious process. Fortunately, there are some estate planning tools that will really help you in both of these instances. Not only will this allow you to privately divvy up your estate as you wish, you can keep the information away from public scrutiny. The probate process is part of public records, meaning that your loved ones could fall prey to predators going after their inheritance. Limited Liability Companies, or LLCs, are an effective tool to manage your rental and income-producing real estate. You can form an LLC that owns the property, rather than taking title under your own name. As such, the property will not be listed under your name when you purchase it. And, if someone sues the owner, it is the company rather than your personal assets that are at stake. Living trusts are an equally viable option, depending on your circumstances. There are various types of trusts available, and your estate planning attorney can help you choose which suits your circumstances best. For many people, a combination of a revocable living trust and LLCs is the ideal strategy to protecting their investments. There are also tax benefits associated with certain trusts as well. If you have real estate property that you need to protect, make an appointment with an estate planning and asset protection attorney today. Protect your personal assets from lawsuits and your family from the heartaches that can follow from the loss of a loved one. Thanks to our friend, trusts and estate planning attorney in Carpinteria, Neal Bartlett, for his insight on estate planning strategies to protect your real estate investments. Neal is the founding attorney at Bartlett & Herrington, PC. He helps families in Carpinteria, Montecito, Ventura and Santa Barbara create estate plans and elder law plans to protect their families and assets. Congrats to our wonderful buyers who just closed escrow on this very cool bank owned property. We absolutely loved working with you both. We can't wait to see you transform your new home. Welcome to Santa Barbara living! This Tuesday's Tips are brought to you by The California Association of Realtors. Make Your Home Into A Model Home! Whether you are selling your home or not, who doesn't want to live in a home that feels like a model! Check out California Association of Realtors top 4 remodeling tricks to make your home feel like a model home. These trends are very popular among builders today! The History of Interest Rates Since 1953! Take a glance at the interest rates since 1953! Today's interest rate of approximately 4.17% looks quite amazing when reviewing the rates over the last 64 years... Wow! *Information provided by WFG Title, of Santa Barbara.